I am back in New Zealand with this classic Sauvignon Blanc. 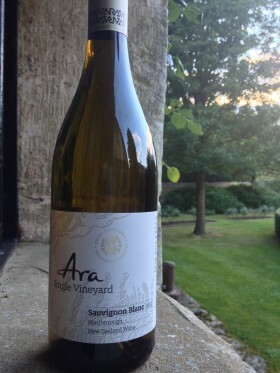 The Ara vineyard is in the most south-western corner of Marlborough and is a sustainably managed vineyard and this wine itself has far too many awards for me to mention, I felt intrigued about this wine and I checked out there website and it is fantastic. I now look them up about once a month and follow their blog posts, it really is interesting and the love that goes into making their wine is evident. Drinking this wine is delightful, it is refined elegant and dances with your palate as flavours leaping to inspire your imagination of the New Zealand valleys, clean, fresh and full of grapefruit type flavour. Do check out www.arawines.com I bought this wine from Waitrose and it was on special at £8.99 down from £12.99.